Tiny homes are slowly popping up across the nation and across media outlets. That being said, when it comes to the tiny home movement, you’re not just downsizing by a couple hundred feet, but instead, living in a couple hundred feet. Most tiny homes rarely exceed 500 square feet; no doubt an adjustment if you come from a home that’s 2,000. The idea behind most tiny homes is to live a little more minimalistic, save money, and possibly travel more. Tiny homes no doubt have their appeal. They cost less, require significantly less upkeep, and are supposed to help take some of the stress out of life. However, the idea of a tiny home might be a lot more ideal than the reality of it. If you’re pondering the possibility of a tiny home, consider these six tiny house problems before making the move. Tiny homes are appealing to a small group of people. Even if some might think the idea of a tiny home sounds idyllic, they’re for the most part impractical to the average person. For many the idea of giving up the majority of their belongings is less than ideal or if they have a family, the home is simply too small. Moreover, the lack of space can feel confining to some. Whatever the case, the group of buyers available should you ever need to sell your home is sparse, which means your home would simply be less marketable. In the end, you could be in for the long-haul if you decide to move forward with a tiny home. Even the most social of people need their space and privacy every now and then. Move into a tiny home, however, and you can kiss any semblance of privacy or space goodbye. If you’re planning to live alone, you won’t have to worry about this; live with another person though, and you might feel as though you’re on top of one another. Tiny homes rarely, if ever, are able to be separated into multiple rooms. In most cases, tiny homes have an open floor plan and the only space with privacy is the bathroom. If you’re someone who doesn’t need alone time, then a tiny home might work for you. 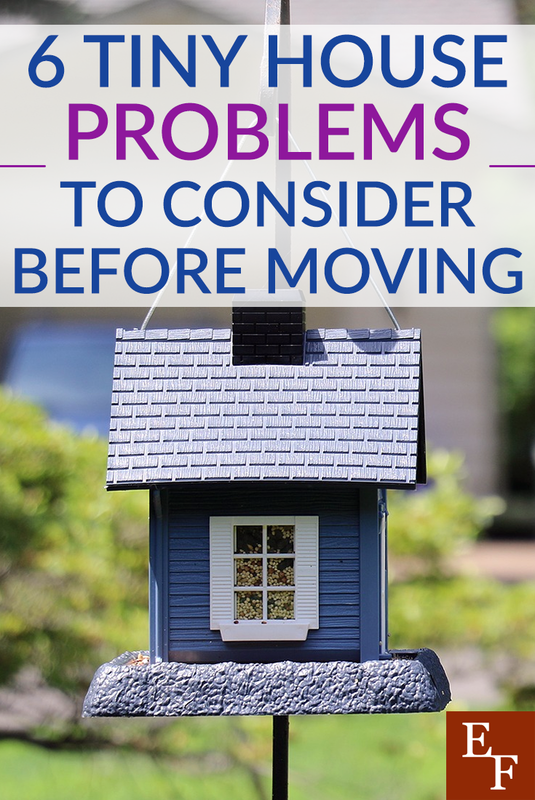 But, if you need to be able to get away, you may want to rethink a move into a home that’s 200 square feet. One of the biggest benefits claimed by the tiny home movement is the idea around saving money and reducing your home costs. While this can be the case in certain instances, it’s not true of every tiny home owner. For starters, if you don’t want to or merely can’t get rid of the majority of your belongings, you’ll likely need to rent a storage unit to accommodate the extra. Furthermore, the ability with which you can entertain or throw events in your own home is drastically decreased, and again, you might find yourself spending extra to rent out a space. Even more expensive then space rentals, however, is the piece of land you might need to put your tiny home on. And even if you opt to live in certain locations temporarily, the expense of moving your tiny home isn’t exactly cheap either. Opting for a tiny home means giving up certain amenities and comforts. Adjusting to the minimalistic lifestyle, the changes in simple things like your shower and toilet (as you likely won’t have a plumbing system you’re used to), and most of all a lot less space, isn’t something that takes place overnight. If you’re set on moving into a tiny house, you’ll have to be prepared to be uncomfortable for a couple of months to a year. It’ll take time to figure out new ways to do things and settle in to new habits. Again, if you’re living with a significant other, be prepared to figure out the best way to live together in a much smaller space. All in all, a tiny home takes a transition period and it’s important you’re aware of that before officials moving. A tiny home is called a tiny home for a reason, it’s not meant to accommodate a family of six, your large walk-in closet of clothes, or your wall-to-ceiling bookcases full of every book you’ve ever purchased. Living in a tiny home doesn’t work for everyone or every lifestyle. If you’re someone who loves to entertain and have dinner parties, then the small kitchen space and non-existent dining room, might prove difficult for you to adjust to. Have three teenage children or a significant other who stays up late to watch tv? You just might find that your 300 square-foot home isn’t ideal to teenagers that want privacy. It may not work to have guests over. You may find yourself with lack of sleep from having to listen to the television every night. Before opting for a tiny house for your family, carefully consider whether or not it suits your family, lifestyle, or even the hobbies and activities you partake in on a regular basis. Before even considering a tiny home, you’ll want to ensure your city or state’s regulations allow it. This is especially true if you plan on staying in one place. Moreover, lack of space might mean more time outdoors. If home for you gets brutally cold in the winter or is constantly raining, you should consider whether or not you could spend pro-longed periods of time in much smaller area. Overall, figure out beforehand where you’d like to be and whether or not it’s a possibility. It could make or break your decision to go with a tiny home. If the idea of less space doesn’t bother you, and the idea of picking up your home to travel or living a more minimalistic lifestyle is appealing to you, then a tiny house might be a dream come true. As with any major move, carefully consider all the challenges that come along with a tiny home before moving in. In the end, you’ll either decide it’s the perfect space for you or find that you simply need more than 400 square-feet to call home. Have you considered a tiny house? What aspects of living in a tiny home appeals most to you?